The Burgundy Canal is built in a "pyramid" style climbing up one side of a hill and going down the other side. It uses a natural water dividing line at the summit, where a tunnel joins the two sides. The water necessary for supplying the top section of the canal is collected via rain and stored in reservoirs. The lower sections use the water from rivers flowing beside the canal and also the water accumulated in the higher sections. The reservoirs are located near the the summit of the canal, their purpose is collect water from the surrounding hills and store water for later use. Generally they fill during the winter period, when there is much more rainfall and snow. Throughout the year, the water is slowly drawn from the reservoirs in a controlled manner and feed into the canal via small "canals" and dykes. Please see the pages "The reservoirs and water supply" for more information. 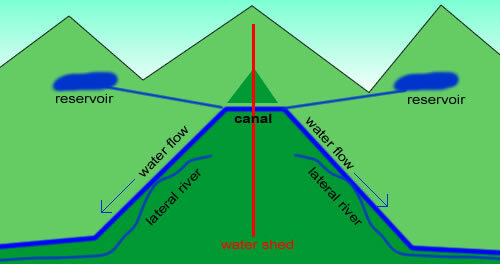 As the canal descends the hills, the water supply is assisted by rivers which flow beside the canal. Actually the rivers where there before the canal and the canal tends to huge the trajectory of the rivers. At certain points the water of the river is held back by small dams and weirs, and then diverted into the canal by sluice gates. Where the canal is higher than the river, it is common to see sluice gates capable of emptying water from the canal into the river. The canal requires locks to allow boats to navigate on controlled waters. Quite simply, if there were no locks, the water would flow into the main rivers and the canal would dry up. By having locks, the water is retained just like with a dam, and can be used when required. When a boat needs to pass through a lock, the boat enters the lock the doors are closed and the the filled or emptied as needed. If no boat passes through the lock the water is held back. There is actually a continuous debit of water from most locks, which is called "the current". The lock keeper will be informed and the rate of current required. This is for multiple reasons, such as compensating the stretch of water below due to leeks, preventing overflow in the stretch of water above, maintaining oxygen and preventing stagnation. Please view the page "How a canal lock works" to understand the operating sequence of a lock.